Danny Ingrouville is no ordinary artist. He is a dramatic, disruptive creative force to be reckoned with. And he credits his freedom-to-create…to the Cambridge Centre For The Arts. “Through this organization, through the City of Cambridge, with the total confidence of people like Sophie McCann, Wanda Schaefer-Stilling and Gwen Stott, I have discovered that I AM an artist,” insists Ingrouville. “This would not have happened for me in Toronto,” he is quick to add. Cambridge artist Danny Ingrouville draws from years of experience in the creative arts. This includes dance. His Big Sky Dance company was an inclusive dance experience for people from 6 to 76. No trained monkey techniques or pasted on smiles, this was the real deal, a dance experience interpreted and created mostly by the participants themselves. It was not a recognizable dance BRAND …It was dance like no other. Ingrouville is the recipient of the Bernice Adams Award for Performing Arts in recognition of his creative dance productions he produced in Cambridge. In 2013, Ingrouville became Cambridge’s Artist In Residence (AIR). His year at the helm was spent in no La-Dee-Da manner or fashion. It was in the trenches, helping a long list of Cambridge retailers present themselves to the buying public. The project was called Destination Cambridge…and thanks to Danny, it was both interactive and a great success. Ingrouville has amassed a long list of competencies and achievements on his artist journey. 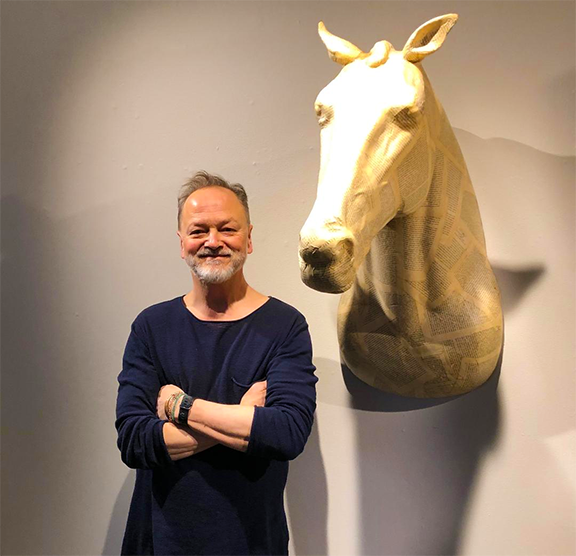 It is the culmination of these activities which has brought him to this place, this space, for the opening night of TERRA ROAD his sculptural debut at the Cambridge Centre For The Arts. TERRA ROAD is an immersive sculptural installation. It is a wander through a man-made forest in which civilization parallels natures design…it’s also poetic throughout. TERRA ROAD is a path that takes us from our natural routes to the designs of our daily life. It is a recognition of the rural and its influence on our urban design. Terra Road is a statement of acknowledgment that we are nature. Like the animals and everything else on the planet, we came from natural beginnings which have influenced our every development and direction. From the beaver cleaning the birch twig for its placement in the den to our laying of upholstery and wall paper in our homes, from a horse head wrapped in pages of Henry David Thoreau's Walden, to birds suggestion that we too can fly and the message of power and stability of trees, we are borrowers of all that we see around us. As technology progresses and the cryptic workings of these technologies lead us further and further into an unsure trust of the workings of the future, we can stop - breath - and look back at nature and know, at least for now, how we got here.